NEW YORK, May 19, 2017 /PRNewswire-USNewswire/ -- The U.S. Food and Drug Administration has granted accelerated approval to a second drug in less than a month for first-line treatment for advanced bladder cancer again based on clinical trial findings from the same researcher from NYU Langone's Perlmutter Cancer Center. 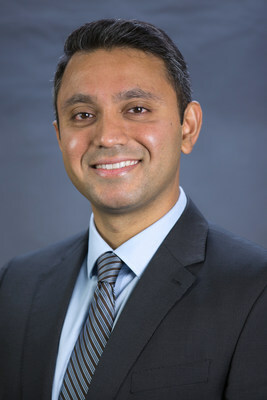 In a study led by medical oncologist Arjun Balar, MD, the newly approved drug pembrolizumab, marketed under the brand name Keytruda, was shown to harness the immune system to shrink tumors in bladder cancer patients who could not tolerate the most effective chemotherapy, offering hope to individuals with advanced disease. These findings were first presented by Balar last October at the annual meeting of the European Society for Medical Oncology in Copenhagen and followed by an updated analysis in February at the Genitourinary Cancers Symposium in Orlando. Pembrolizumab joins the other recent FDA-approved bladder cancer drug atezolizumab (marketed as Tecentriq) as yet another treatment option. Atezolizumab's approval by the FDA last month also was principally based on clinical trial findings by Balar, who presented those in June 2016 at the annual meeting of the American Society for Clinical Oncology. In addition to frontline treatment, the FDA also approved pembrolizumab for patients with locally advanced or metastatic bladder cancer who have disease progression during or following platinum-containing chemotherapy or within 12 months of neoadjuvant or adjuvant chemotherapy treatment. "It is extremely encouraging for those of us who study and treat bladder to know that we now have a more robust set of FDA-approved options to aggressively combat this very serious disease," Balar says. "Approval of pembrolizumab underscores the prominent role of clinical research at Perlmutter Cancer Center." Balar's study found that injections of pembrolizumab shrank tumors by at least one third in 24 percent of study participants. Of those, five percent saw their tumor lesions disappear. All patients in the study were unable to take the current standard of care, cisplatin, which is a chemotherapy that prevents tumor cells from repairing damage to their DNA. More than half of bladder cancer patients, most of them elderly and ill, cannot take cisplatin because of its toxic effects on nerves, hearing and kidneys. "While five percent of patients who saw complete remission may seem like a small number, it's important to note that these patients would otherwise have no approved first-line treatment option and on average die within ten months," says Balar, an assistant professor of Medicine and Director of the Genitourinary Medical Oncology Program at Perlmutter. About 76,000 Americans were diagnosed with bladder cancer in 2016, with men three times more likely than women to develop the disease. While 62 percent of patients in the study experienced side effects linked to pembrolizumab treatment, most were tolerable, including fatigue (17 percent) along with itchy skin and diarrhea. Five percent of patients in the study stopped therapy because of side effect severity. When compared to chemotherapy, the side effect profile of pembrolizumab was "far less severe", Balar says. In addition, among patients who achieved a response, 83 percent were on-going at a median follow up at five months, while responses to most chemotherapies are temporary, he says. Part of a new class of drugs known as checkpoint inhibitors, pembrolizumab has been approved since 2014 for the treatment of head and neck squamous cell carcinoma, melanoma, and non-small cell lung cancer. The clinical trial, called KEYNOTE-052 (ClinicalTrials.gov, NCT02335424), enrolled 370 patients at 50 research centers in the United States and Europe..
Checkpoint inhibitors focus on activating the immune system, which is designed to attack foreign organisms like bacteria, while leaving the body's healthy cells alone. To spare normal cells from immune attack, the system uses "checkpoints" sensors on immune cells that turn them off when they receive the right signal. The body recognizes tumors as abnormal, but cancer cells hijack checkpoints to turn off immune responses. Among the most important checkpoints is a protein called programmed death receptor 1 (PD1), which is shut down by pembrolizumab to make tumors "visible" again to the immune system. Past studies have found that levels of PD-L1, the signaling partner of PD-1, vary dramatically across patients with bladder cancer. Higher levels of PD-L1 are associated with higher likelihood of response, however responses are also seen in patients with low or absent levels, frustrating efforts to arrive at a consensus threshold for when doctors should prescribe or not prescribe -- pembrolizumab or a similar agent in this class. The study was supported by Merck Sharp & Dohme Corp., a subsidiary of Merck & Co., Inc. Balar is a paid consultant to Merck, the manufacturer of study drug, and the company that funded the study. The terms of these arrangements are managed in accordance with NYU Langone policies.